How to subtract N working days from the current date in Java? Home Date Interview Questions Difficult Date Questions How to subtract N working days from the current date in Java? Write a program in Java that subtracts N working days from the current date and prints new date with proper validations. There are 5 working days per week (Monday, Tuesday, Wednesday, Thursday, Friday). Here in a loop we are subtracting 1 from the current date and checking day of that date. If it is Sunday or Saturday then we are doing increment to the value of N because we are interested in working days. We need to do subtraction from current date using add() method of Calendar class that accepts DAY_OF_MONTH constant and number of days that you want to subtract in negative format. How to how to find every information about given date? * @problem How to subtract N working days from current date? // Subtracting 1 day from calendar. Output - How to subtract N working days from current date in Java? How to subtract N working days from given date in Java? 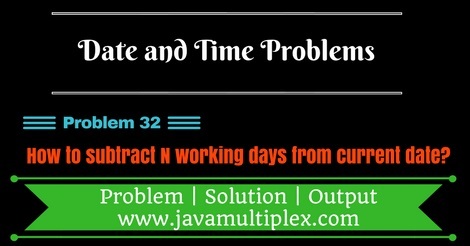 Tags : Date and Time problems, Subtraction of n working days in Java, Solution in Java, if else statement, for loop, Calendar.